It’s fall. Leaves are part of the scenery right now! 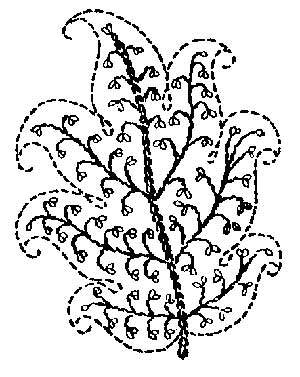 Here’s a leaf – not necessarily fallish – to add to your collection of embroidery patterns. I say “not necessarily fallish” because it all depends on the color you use to embroider this type of leaf. You can choose fall colors or spring colors – the leaf is pretty universal; the interpretation of it is up to you! This is another pattern with a bit of Jacobean flair. You can resize it in your own photo editing program after you’ve saved the design to your computer (click on the leaf pattern for a larger version, then right click on that and save to your computer). It’s rather large, but, depending on what you want to do, that could be useful. The outline suggests running stitch, but you really could use any kind of outlining stitch on this type of motif. The spine in the middle of the leaf is chain stitch or split stitch, and then the smaller veins are stem stitch or outline, or even whipped running – it’s really up to you. The little “buds” on the veiny lines would be easily done in daisy stitch (detached chain). Next Next post: Jacobean Embroidery Pattern: Hanging Flower – Good for Goldwork, too!